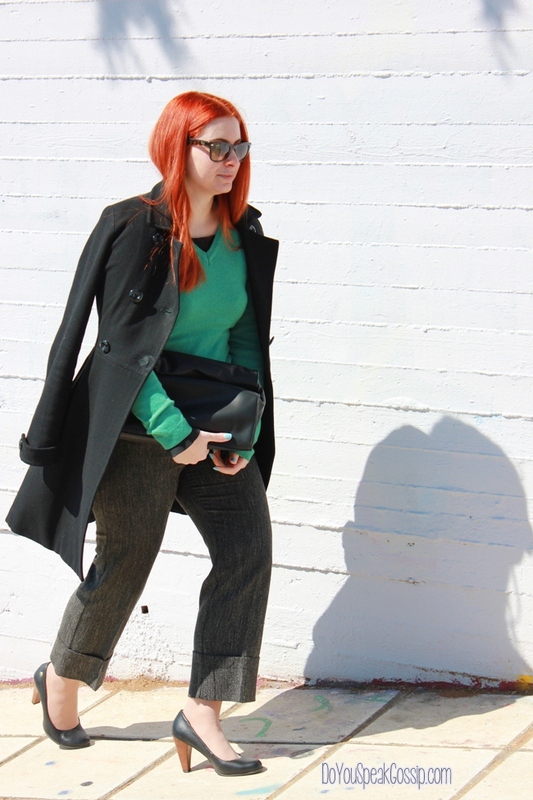 Red, green, black | Outfit post - Do You Speak Gossip?Do You Speak Gossip? 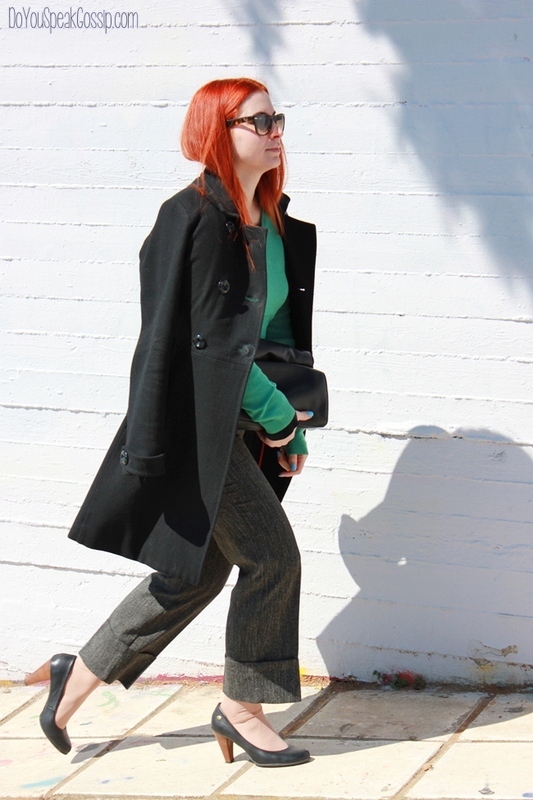 I wore this outfit on Sunday, which was St. Patrick’s Day so I decided to add a little bit of green in it. As I’m on my last months of Shoe Saving (per the rules of the Shoeper Shoe Challenge by Shoeperwoman.com, I have to wear all my shoes at least once in the duration of a year) I’m trying to wear all my remaining shoes, even those which I hadn’t wear for quite a while, but still have a special place in my heart. At first I wore these Hispanitas with the metallic kitten heel, but as I find kitten heels difficult to walk in, I changed into another pair later, which I’d probably have chosen anyway to wear these days. So these are SS#51 and #52. Which pair do you like the most? You look fabulous, as usual! Looking at your pictures, it’s like my “weekly fix” of Vogue editorials! Amazing outfit, I loved the greean jumper/sweater and my favorite pair of shoes I guess you know: the second one! 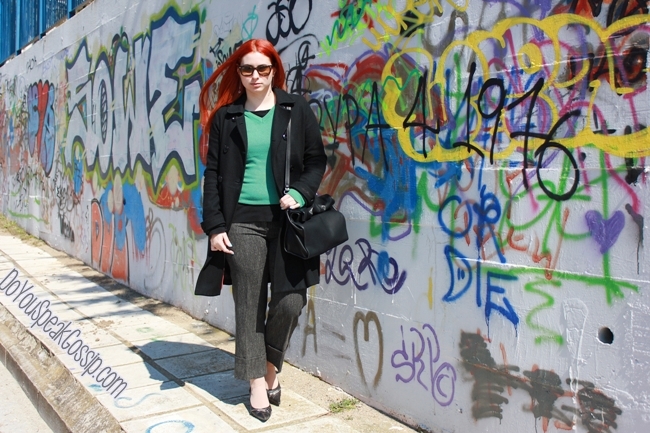 The location was also great, I love colorful places! Makia! Most of the graffiti were painted over but one of the walls still has the ones you see here. I like the first pair of shoes a lot! Glad to know that someones like them too, and that they’re not totally outdated. Oute kai egw! Ta sigekrimena ta exw apo to likeio kai ta foresa logw tou Challenge pou pairnw meros, alla poli sintoma allaxa sto 2o zeugari, pou einai poli pio aneto, arkei na min exeis na kaneis poli perpatima. Your hair looks amazing!touch of green is lovely and you have styled this look so tress chic. Thank you very much my dear Ramona! Trying to make the color of my hair stay but I fail, since it needs dying every 3 weeks. mou arese poly o syndiasmos twn xrwmatwn! xixi Na’sai kala! Isws mporeis akoma na ti vreis sta Zara kai einai para poli oikonomiki. Τα μαλλιά σου κι εδώ, ιδιαιτέρως εντυπωσιακά!! I am in love with your bag! I also like the color of your jersey! CaterinaDrak recently posted..my outfits. The leopard Blazer. Thank you very much Caterina! Great look!! Love your hair! Hope you visit my blog!! Thank you Olga! Of course I’ll visit your blog! I always visit back…to check out your blog and comment. Δεν εχω κατι να πω παρά ΚΑΘΑΡΟ LOOK. Όταν είναι συγκεκριμένη η εικόνα και δε μπερεύεται το ματι δεν υπάρχει περίπτωση να μην είναι κάτι ωραίο. Ιδιαίτερα για μένα το παντελόνι και τα γοβάκια. Μπράβο!